These two borders are inspiration from randje per week cross stitch challenge 2015. This border is very simple. Starting the anchoring stitch. Just work as herringbone stitches, remember to slide under the needle on alternate stitches. The extra two squares get attended on return journey. Did I mention this border is continuously worked, no breaks in between? Just as the anchoring stitch the interlacing is also simple. We are working on one side on the onward journey, will take care of the other side on the return journey. Mirrors can be stitched in the spaces, which will make the border more attractive. The pattern drawn for the second motif is different. When I drew it , the idea was to explore the possibilities. When I started working I realized the second part is similar to border#14, so I skipped it on the sample. 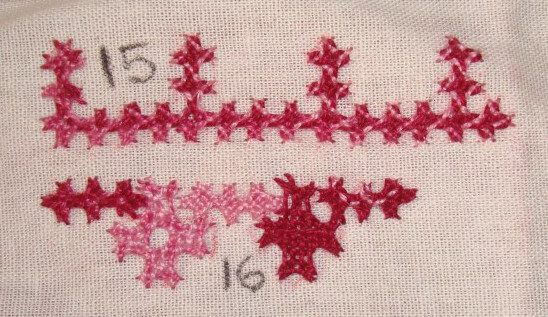 This pattern is made of two kutch work treatments- one is a small border and another a motif. The border made of three kutchwork squares. We have to work the bars for the motif. Taking care of the extra interlacing. Completed the motif with space in the middle. When I worked the second motif, I slipped to woven kutchwork. Reason- not paying attention! It would look better if there is space in between the varying kutchwork. It is better to draw this in the beginning. They can also be worked in two colours. VERY interesting to see how these patterns are worked. When I saw your pencil design I did not understand how the squares would work. Now I see it is all in the lacing. Thank you. I had to change to the formation to get this effect, from which I also learnt of working the vertical and horizontal kutchwork together in a pattern. oh I like this very much – your instructions are clear, and this is a very pretty border. Your suggestion of inserting mirrors in between would be a nice touch – I think I would like to try this ! Your kutchwork looks wonderful and such an intricate looking stitch. Thanks for the pictures and explanations.